What do Madhesi parties want? KATHMANDU, APRIL 17: The Federal Alliance (FA), an alliance of fringe Madhesi and Janajati parties which have been demanding major revision in the statute before the local polls, has unveiled additional programs of protest which its leaders say is "aimed at sabotaging the elections process". The 15-day protest program made public amid a press meet on Sunday among others includes an infinite general strike days ahead of the polls. The announcement that comes five days after the government registered the 11-point constitution amendment bill and four days after the United Democratic Madhesi Front (UDMF), a constituent of the FA, declared to boycott the polls, has cast fresh doubts on whether polls would be held on the stipulated date. On Wednesday, the UDMF had rejected the bill and announced brief protest program against the polls. "The latest constitution amendment bill registered by the government in parliament is not only incomplete and erroneous but is also against the understanding reached with the UDMF and the FA," FA spokesman Om Gurung said in a statement. Gurung said that the demands of the agitating parties should be met by upholding the past agreements before the elections. The FA has put forth a 26-point demand which among other things includes major realignment in the federal boundaries. UDMF, an amalgam of seven Madhes-based parties, has also made realignment of federal boundaries its main demand. But the 11-point bill registered last week makes no reference to formation of another province in the tarai. The previous bill which was withdrawn hours before registering the new amendment bill had proposed carving a province incorporating five districts of the tarai. Though the new bill seeks to end the row over the federal boundaries through a federal commission, Madhesi leaders said that there should be constitutional guarantee for formation of another province in the tarai plains. Besides federal boundaries, other major demands of the regional parties include endorsement of the amendment bill and increase in the number of local units. 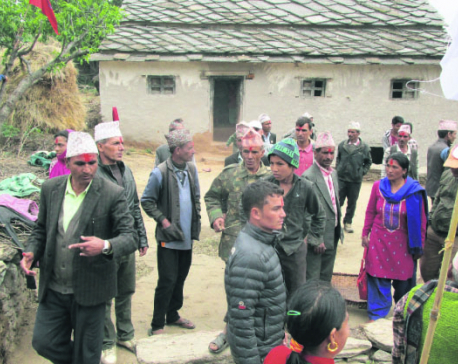 Mahantha Thakur, the chairman of the Tarai Madhes Democratic Party, said that the agitating parties were ready to take extreme measures if elections are 'imposed' on them without addressing their demands. "The government has already pushed Madhes to the wall. They cannot push us any further. The anger will burst," Thakur told Republica. FA Coordinator Upendra Yadav said that the alliance decided to fully concentrate on struggle after the government made no serious attempts to address their concerns. "He (Prime Minister Dahal) repeatedly assured us that our concerns would be accommodated in the new constitution. We believed him and gave him time to resolve the issues. But he kept none of those promises. This was not expected from him," Yadav, also the chairman of the Federal Socialist Forum Nepal (FSFN), told Republica. FA leaders said that the agitating parties would not withdraw the protests unless the government postpones the election process. They said that a new date should be announced based on consensus. Rajendra Shrestha, a leader of the Federal Socialist Forum Nepal, said that the local elections should be deferred and elections for provincial and national assemblies should be announced instead." "This local election is meaningless as there are many disputes over the local boundaries. We strongly believe that the elections of provincial and national assemblies should be held separately or together before local polls," said Shrestha, who was in a taskforce to negotiate with the governing parties to draft amendment proposal.